The idea of having more than 1 brain is ridiculous, but in fact, it’s what many of us ask our hitters to have on every swing and every time we work with them. Find out how harmful this can be! Teaching your hitters to think about too many different body parts during the swing will lead to nothing but struggle. Find out how to help your hitters find success using only 1 brain. When I say that your hitters only have 1 brain, I mean it. Too many of our hitters have their brain placed on so many different body parts while they’re swinging it’s as if they’re trying to hit using 10 different brains all at the same time. Just the idea of this seems crazy let alone the picture you just got in your head. You can see your player standing there in her stance with a brain on her back foot, another one on her hips, a 3rd one on her top hand, and 4th one on her front arm…you get the idea. Every time we mention a body part as important to the success of a skill, in this case hitting, we’re asking our players to focus on or concentrate on that particular body part. We’re asking them to stick their brain on that body part. The problem is that our players only have 1 brain, not 10, so we need to determine the most important body part for that player on that swing, and ask them to place their entire brain on that body part. If we’ve done our work and identified the MAIN issue then the player should immediately see some results from their focus. This list, taken from my Hitting eClinic: Successful Hitting through a Detailed Knowledge of the Swing, shows that coaches and players have completely different ways of looking at the same skill – in this case Hitting. Look at the Coaches list and you can see we want the complexity of hitting, we enjoy all the details, we want to know all the details and we need to know the details in order to help diagnose players. Now look again at the Players list and it becomes a very simple list. There’s nothing complicated about it. Hitters don’t want the details, they want the hits. Period! So as coaches we’ve got to explore the complicated in our own quest for information and knowledge, but we’ve got to filter this complexity and SIMPLIFY it when working with our hitters. 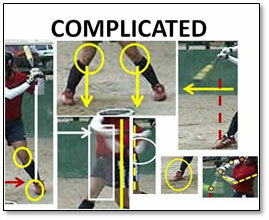 If we teach too complicated then we’re asking our hitters to place a brain on every single body part we mention – something that pretty much guarantees they won’t succeed. But when we SIMPLIFY our knowledge then our players can place 100% of their focus (or brain) on the single body part we’re talking about – thus greatly increasing their chances for success! Simplifying things isn’t easy, let alone trying to do it for something as complex as the softball swing, that’s why it takes an excellent coach to be able to do so. Too many coaches think that by making something sound complicated your players will think you’re more intelligent as a coach, when the truth is, players don’t really care if we’re smart they only care if we help them get better! One method empowers YOU while the other empowers YOUR HITTERS. We all need to do our best to constantly learn what really happens during a skill, but we can’t stop there. We must also learn how to effectively teach our players those things as simply as possible. Learning the details of hitting and yet teaching it simplistically to our hitters is a very difficult tightrope to walk but one that results in a tremendous amount of success. Avoid complicating skills by focusing on too many different elements and asking your players to place too many different brains on too many different body parts. Simplify things; communicate in whatever method best helps your players get the information from their brain into their hands and feet. While it’s great that you’re trying to make yourself smarter as a coach, ultimately, you’re coaching a softball team and not trying to win the “smartest hitting coach” contest. So that means you’ve got to work just as hard to find ways to transfer the information you know into the hands and feet of your hitters as you did to learn all that information in the first place. Successful Hitting through a Detailed Knowledge of the Swing (eClinic) – A more in-depth look at hitting through the various parts of the swing! Hitting Levels 1-7 (eSkill Hitting Package) – An over-view of the different types of hitting including bunting & slapping! Softball Hitting Drills for a Great Swing (Drill Manual) – A hard copy Drill Manual with over 75 different Hitting Drills for all skill levels! Softball Hitting Drills for a Great Swing (eBook) – eBook Version of our Hitting Drills Manual – over 75 different Hitting Drills for all skill levels! REMINDER: if you’re already a Vault Classic member then you already have this eClinic and eSkills package in your locker! What a great article. 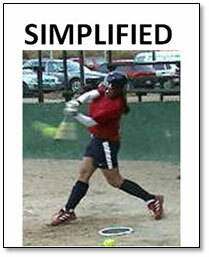 This has always been my philosophy when coaching, KISS, KEEP IT SIMPLE STUPID! Coaches who completely deny or fully ignore that a person’s subconscious controls their actions complicate their athlete’s instruction. However, when a Coach uses their athlete’s subconscious responses to tell them what they need to address, the Coach uses one brain to guarantee sustainable success.